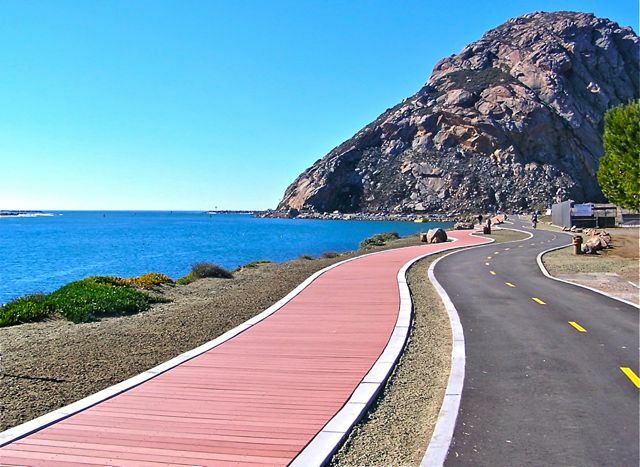 MORRO BAY’S NEW BRIDGE AND PATH IS A BOON TO CYCLISTS! 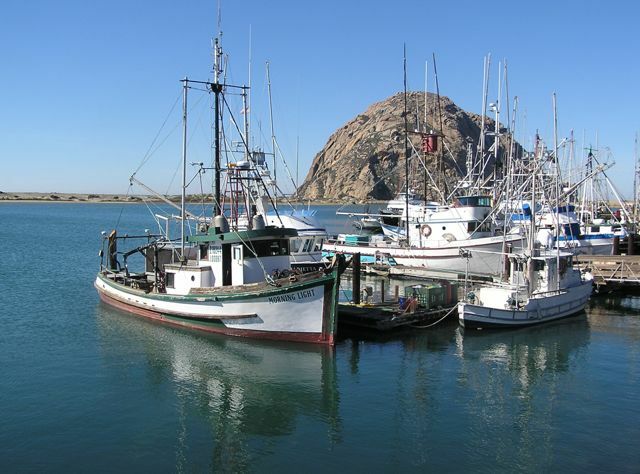 Morro Bay in San Luis Obispo County, CA is a wonderful coastal town to visit for its scenic vistas punctuated by the extinct Morro Rock volcano that guards its picture perfect harbor, its fabulous beaches, and its waterfront downtown tourist district. enCYCLEpedia Southern California described cycling in town as split into the north and south segments, connected by a spin through the hilly and busy downtown corridor. 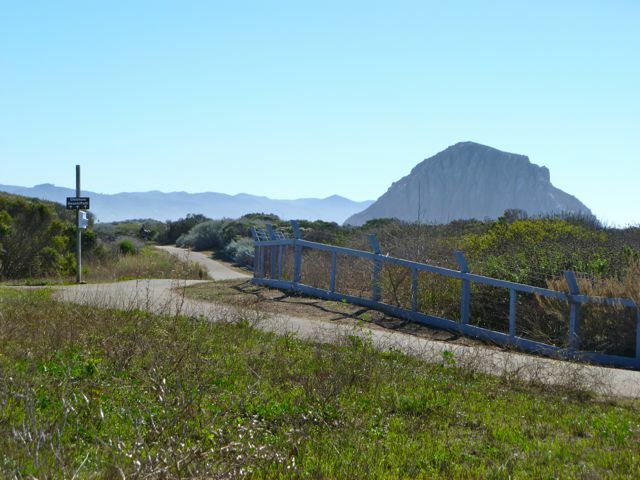 As promised, and mapped in the book, the vital new Morro Creek Multi-use Trail and Bridge – an extension of the Morro Bay Harborwalk, is open as of July 4, 2015, making a cycle through town a seamlessly delightful experience closer to the beach and without the hills and busy downtown streets. 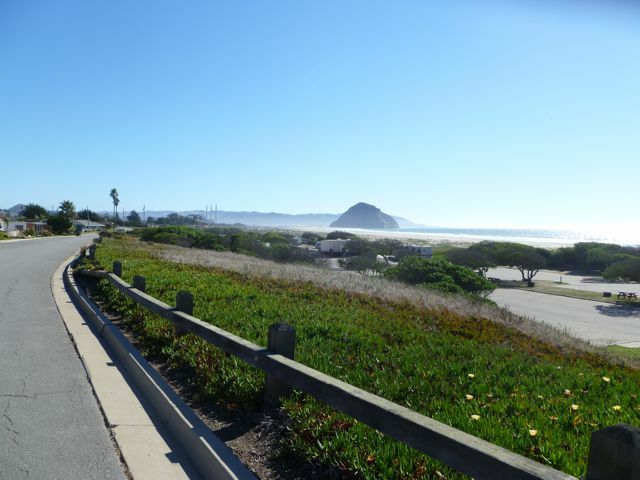 Campers can choose from Morro Bay or Morro Strand state parks or several private parks in town, and cycle right from their sites. The bike/ped bridge is a pre-fabricated steel structure that is wide enough for emergency vehicles but not open to general traffic. The project was completed in time for the July 4th bike parade. Picturesque harbor at Morro Bay. The existing short and sweet Harborwalk path leading to Morro Rock. 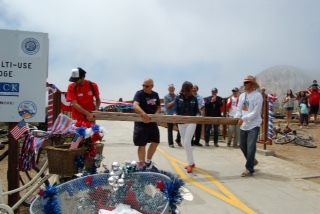 Ribbon cutting ceremony for new trail and bridge, July 4, 2015 (Courtesy of City of Morro Bay). New bike bridge connects north and south parts of Morro Bay. These beautiful beach pathways in North Morro Bay are now much easier to access on a pedal through town. View of Morro Strand State Beach at the north end of town.